A wonderful ornamental clumping grass Sisyrinchium ‘Devon Skies’ has strap like leaves and very pretty blue flowers. 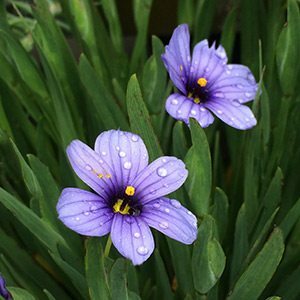 The common name is ‘Blue Eyed Grass, and this is a sterile cultivar, so it will not self seed and is only propagated by division. The large blue flowers with darker veins and a deeper blue ring surrounding a yellow centre, the flowers appear over a long period in summer, reaching around 15cm in height and forming a clump over time. (flowers can be a little variable in color). Although this is a native of North America, this is a chance seedling of Sisyrinchium angustafolium found in Devon in the UK, hence the common name. Excellent in a humus rich well drained soil in the rock garden, or perhaps grow this on in a container. Use ‘Devon Skies’ as a low growing border plant, or for underplanting taller shrubs in the border or in containers. Also suited as an evergreen addition to the rock garden and as a filler in the perennial border. Requires little care, copes well with heat, poor soil and is drought tolerant. Frosts are not a problem. As it is a sterile cultivar, propagation is only by division. Larger clumps can be divided in late winter. Plant in early spring or autumn. Fertilise in spring with a general purpose, slow release fertiliser. Divide clumps every 3 – 4 years to increase the clump and maintain healthy growth.